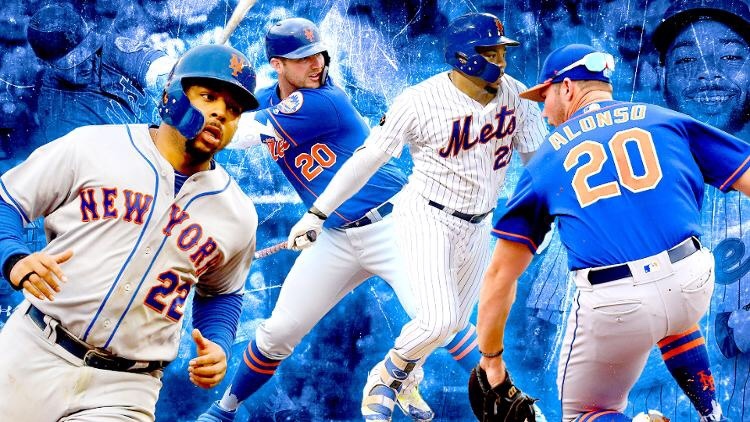 Pete Alonso and Dom Smith, both top round picks, came into Spring Training this year with the same goal, winning the job at first base. However, the journey to the goal turned out to be competitive, yet uniquely bonding between the two prospect first basemen. Smith, who was drafted in the 2013 June Amateur Draft as the 11th overall pick out of high school hasn’t quite exactly lived up to the hype, not yet at least. In fairness to Smith, I believe he was rushed, high school and college draftees usually need different levels of training. Alonso, drafted in the 2016 June Amateur Draft as a 2nd round pick out of the University of Florida, has spent the better part of the last two seasons just crushing the ball throughout the Minor League levels. Smith came into camp this spring being issued a challenge by Mets coaches and management, Smith of course accepted. Eventually, Smith issued a challenge of his own to Pete Alonso over a steak dinner, with the obvious prize being first base. However, what happened next speaks about the character of these two young men. They didn’t ignore each other, they didn’t exchange words under their breath, they didn’t sit in he opposite ends of the clubhouse and dugout. Instead, the duo started to support each other. Smith told Alonso, “What I encouraged him was to just keep doing your thing, keep putting pressure, let’s make it tough on Brodie to make a tough decision”. I don’t know how tough of a decision it was for Van Wagenen, but he is sticking to his word by carrying the best 25 they believe they have. That includes a team with both Peter Alonso and Dominic Smith. Now the two seem inseparable in the dugout, always cracking jokes and smiles and I’m sure passing along information to better each other on and off the field. Smith has appeared in all ten games but only has 11 at bats as he’s mainly being used as a pinch hitter and defensive replacement. He has a .455/ .538/ .455/ .993 slash line in his small sample size but continues to provide A+ defensive at the corner. Alonso has 39 at bats, six doubles, five home runs, and 14 RBI’s in his 10 games played. He’s batting .385/ .429/ .923/ 1.352 and is expected to be one of the front runners for the ROY (Rookie of the Year) award. Next Can Noah pick up Jake?